The other day my Aunt Cheryl brought my grandma for a visit from New Hampshire. I went to A.C.'s to greet them. Grandma was happy to see me. 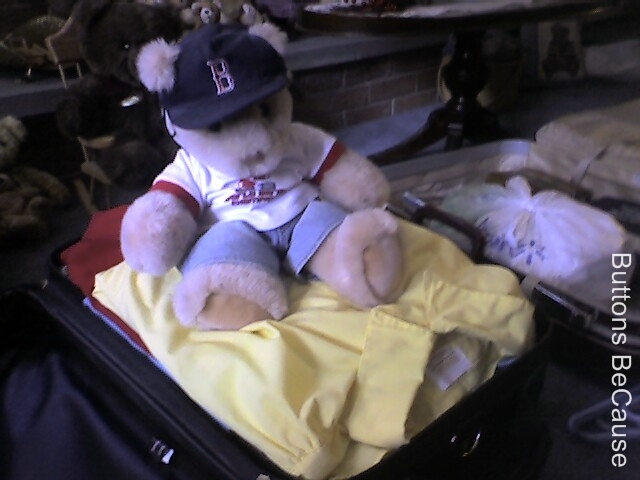 I knew my cousin Bunky was suppose to come with them. But I didn't see him anywhere, finally I asked A.C. where he was? She told me I had to let him tell his story. So, what could I say...he had cell phone pictures! 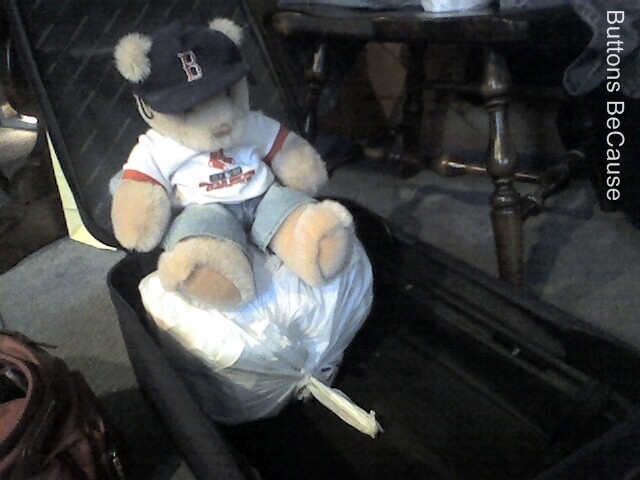 I began my pre-travel inspection as piles of things began to be packed for Grandma's and my trip to IL. 1 day before trip - It's packing day! 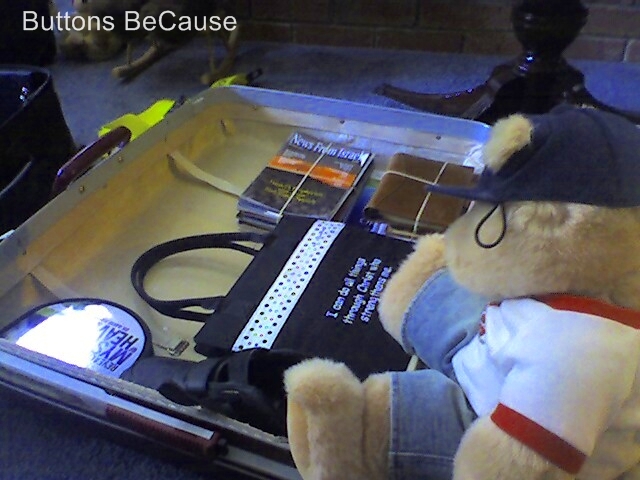 I tried out each suitcase checking for comfort. This one looks too hard. I know how important comfort is,and why Goldilocks tried out all three beds. I was shopping for comfort. But ultimately, my final travel arrangements would be A.C.'s decision. 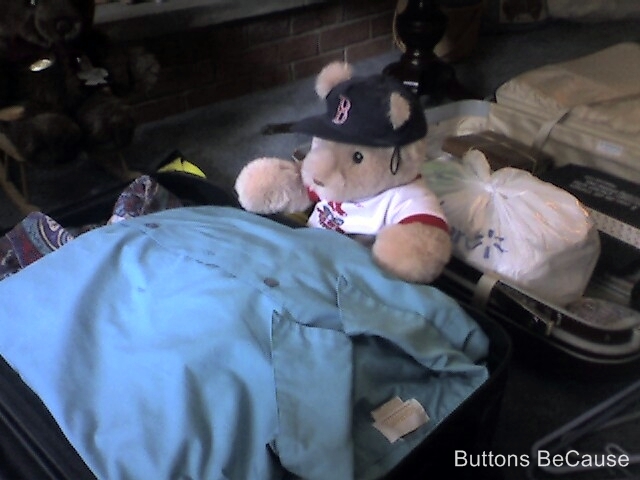 Next, I helped push down the piles that are accumulating in Grandma and A.C.'s suitcases. I began getting worried that there wouldn't be enough room for me! 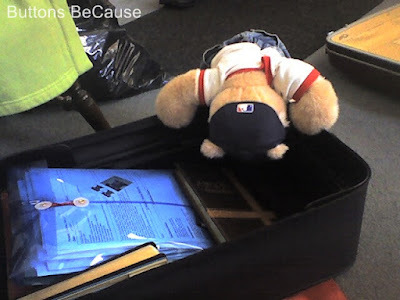 When Grandma and A.C. took a break, I discovered two stowaways, hiding in A.C.'s carry-on bag. The two black bear cubs picked that bag because it was black, and they'd blend in. They found A.C.'s fiber snack bars and offered to share with me. Seeing as it was a hush snack, I took two. A.C. is taking too long, I dozed off for a little nap. I took time out and a seat on the New Hampshire coffee table to say grr-bye to the NH bears. I kept the tissues nearby just in case any of them cried. I finally was directed to my travel nook in A.C.'s carry-on bag. It's a bit tight.... 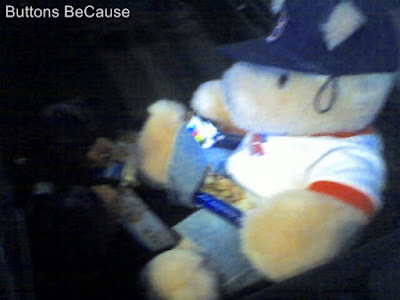 I remember A.C. telling me lie beary still. Especially when she put her bag through the security scan. She said she didn't want to incur any extra fees. I mumbled "no problem, couldn't move if I wanted too" as she zipped the bag closed. I hoped that my little stowaway buddies or I didn't snore too loudly at the wrong time. 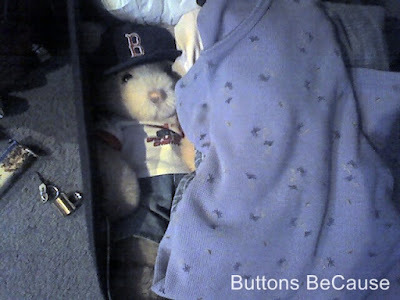 I remembear waking to the sound of A.C. unzipping the suitcase, a bright light and Buttons calling my name. Everything was blurry, just like this picture. Is that you Buttons? I greeted my cousin, "Welcome to IL". Bunky, did you have a nice trip? I don't think I know your friends. Let's get you out of there. Hey Bunky, where's your hat? Bunky told me the little stowaways are twin black bear cubs. Their names are Bernie and Blackie. They are a handful, Bunkey thinks they have something to do with his missing hat. A.C. finally found it a few days later when she finally unpacked. Maybe Bunky has learned the importance of using those elastic ear loops on his hat. Well thanks Bunky for chronicling you journey. Thanks Aunt Cheryl for helping Bunky document his journey with your cellphone camera and notes. And a great big thanks for bringing my grandma for a visit. What a fun story! Aren't grandma's and aunt's great? They always have a little extra jar of honey on hand too! Always nice to have visitors! I like the pictures a lot! Every time G. packs her suitcase our cat is trying to find a place to fit in too! I like visitors! I've never had my own relatives visit though. (The ones I know about live with me!) It looks like he was very well prepared! HEhe that waz a grayte post! 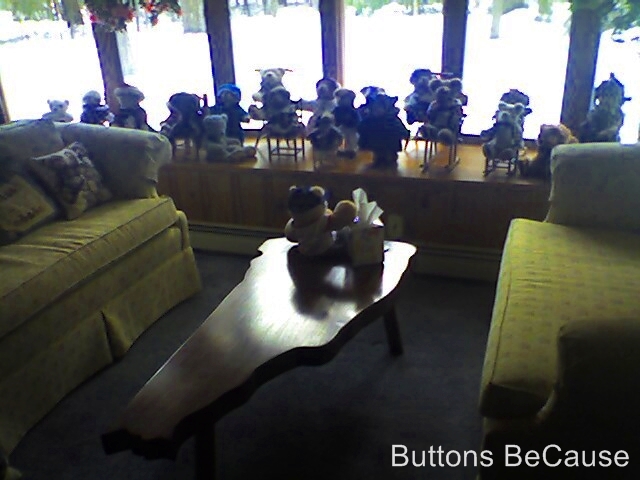 Look at awl those Bears on thare own chairs in the window! WOW that wud be a grayte playce for a Bear pawty! An those littol Bear cubs look cheeky! Oh Buttons, what a wonderful blog post you did on Bunky's travels. It was fun having his help packing up Grandma and me. Thank goodness the TSA guards didn't try to inspect him, he went right through the scanners unnoticed! Grandma and I had quite an eventful trip but I'm so glad to be back home. 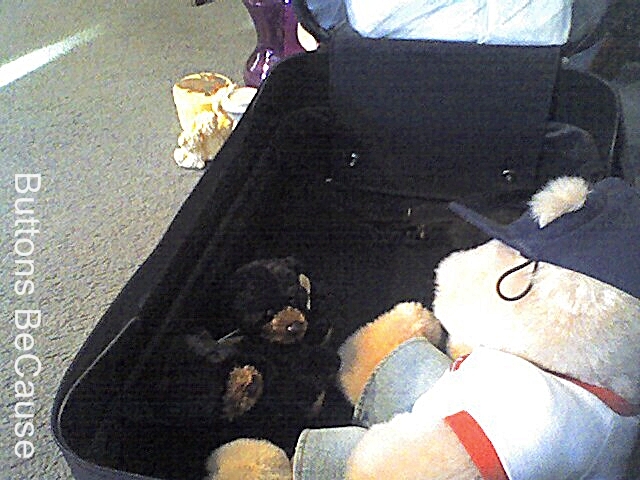 The two black bear stow-a-ways are really liking Grandma's room and getting to know Bunky quite well. They are talking about staying in Illinois... more on that later.